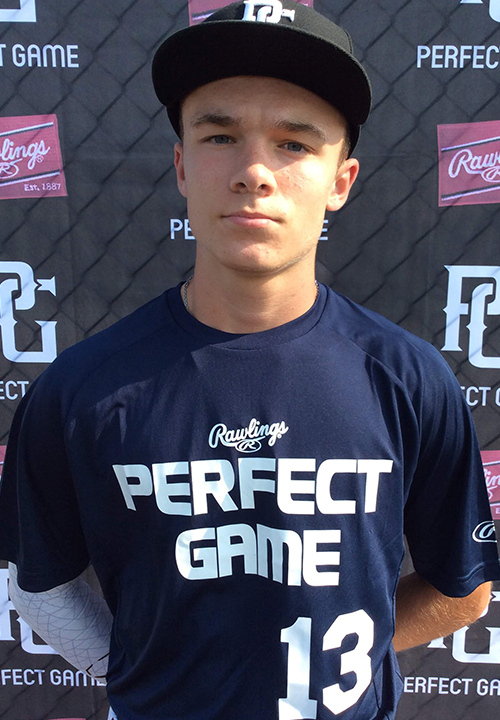 Jacob Williamson is a 2022 1B/OF with a 6-1 165 lb. frame from Iowa City, IA who attends City High. Large frame with a lean build. Frame projects to support additional strength. Primary first baseman, funnels the baseball out front and works through exchange with developing fluidity. Flashed some range while coming off the bag and centering the baseball. Created uphill carry across the infield with developing accuracy at 64 miles per hour. Also worked out defensively from the outfield showing smooth paced, deliberate footwork while closing to the baseball. Picks up ball cleanly and worked through exchange with developing fluidity. Created uphill carry to the bag at 66 miles per hour. Right handed hitter with a spread, balanced stance and leg lift trigger. Compact, direct hand path to baseball and utilized a linear barrel plane. Looked to throw barrel head to contact showing developing bat speed and strength through the zone while employing a mid field approach. Projects for additional jump off the barrel with continued physical maturity. Very good student as well.